The Celts were the only people to use ogam, using it as a form of secret communication, yet it was also used for divinatory purposes. Examples of Ogam can still be seen today, carved on stones scattered throughout the British Isles and the European mainland. Some of the stones are only name tags referring to great heroes in history or used to mark boundaries, but some are clearly of more mystical purpose. Ogam itself is a very complex language capable of many different subtle layers, some of which are lost to us, through its associations with trees different elements and colours one word could mean several things and in the hands of a true bard many political undercurrents could be construed that could crush the mightiest conquerer. 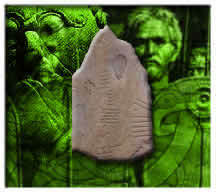 The celts themselves were a fiery creative people, quick tempered and renowned as fearless warriors. This stemmed from their religious beliefs which the afterlife was an integral part of. This belief also had a proficient effect on their culture and most notably their art. The Celtic mythology and art made a profound impact and influence through out Europe. Celts still survive to this day their descendants can now be found in Scotland, Ireland (which has always been the centre of their world), Wales and parts of Brittany and Spain. As I expand the site this section will grow to include a detailed history, mythology, as well as their culture and art.